A mystery bunch of flowers left at the scene of a small grass fire has caused confusion. 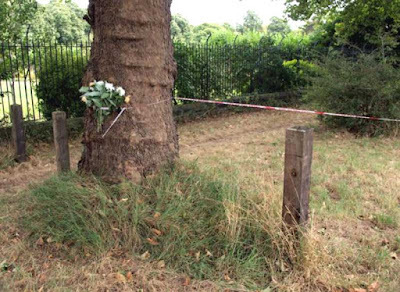 When Clive Power went for a walk around Wanstead Flats in east London on Sunday evening he found a section of grass taped off by the fire brigade and a bunch of flowers next to it. But the 42-year-old was confused when he saw no signs of a car crash at the scene and no note with the flowers. He said: “Someone left a bouquet as if to suggest someone had died, but it was very confusing as there were no tyre marks or signs of impact from a crash.” The mystery surrounding the flowers continued when a spokesman for the London Fire Brigade said the only incident they were called to that day was a small grass fire. They said: “We were called to a small grass fire at 3.30pm on August 21, but it must have been very minor as we left the scene 45 minutes later.” The Metropolitan Police and London Ambulance Service both had no reports of any calls to the scene that day, with no injuries or fatalities. So now we can't mourne grass? Pfft. Thanks, Obama.